The idea of journaling is to prompt self-reflection. Therefore, journal activities in education allow students a chance to focus their thoughts, prepare for a lesson, or debrief from an activity in order for further learning to take place. When promoting life skills, as teachers it is our duty to allow development through practice. For that reason, journaling is in fact practice, mostly in terms of scenarios or conversations that could take place in future social interactions or inside one’s own head. This social and mental health development in Health Education requires practice, just like any other life skill— reading, mathematics, fitness, etc. Here are three types of journal activities for use in Health Class (and teaching in general). The classic type of journaling is of course the basic premise— to put thoughts on paper. Pencil/pen and paper is the most simplistic approach to journaling, but it is always useful because of its immediacy. Give a prompt, specific or general in its aim, and let students write. Responses can be collected, kept in a notebook, or the teacher can let the students decide. It may seem counterintuitive to leave such a decision up to the students in the belief that many won’t write or will simply throw it away, but oftentimes this freedom is effective. Student choice can be advantageous. Journals that are turned will generally include quality reflections that can be used as a student examples or to offer up as anonymous reflections in the next lesson. As for the students who never share with the teacher? Let journaling stand on its own in value. Use other assessments to monitor specific student progress. An additional benefit to student choice in sharing is the class knows, with confidence, that the teacher won’t necessarily read their musings; learners are provided with a chance to be honest with themselves. This is the idea of journaling in the first place: honest self-reflection. How have you been an advocate in your past? Explain what made your advocacy a success. How can social image factor into why teens do or do not start dating? Explain how technology impacts dating relationships, both in a positive and negative manner. Another type of journaling to consider is the online entry. In the 21st century, the use of the internet and cloud storage is only natural. Use a running Google Doc, or something similar, that is always accessible online. Teachers obviously need computer and internet access for this to take place. Provide a journal prompt or thought-provoking statement/article/video, and give students time to develop a think piece. A simple 4-5 minute journal activity is generally enough time to get thoughts on the page, and teachers can also give students the option to continue on their own time. As a teacher you can ask for the document to be shared with you online, or else let it serve as personal notes as the course continues— something learners can have for themselves. If you date or title each journal entry, students can refer to it as a prompt for the next day or it can be used days/weeks later for additional work or as a social bell-ringer. Why is it important to feel a range of emotions in life? Explain a time when your feelings “clashed” and you felt multiple emotions in the same scenario. While being respectful to those involved, briefly explain a bullying scenario you’ve seen online. How could those involved have put healthy decision making skills into action? 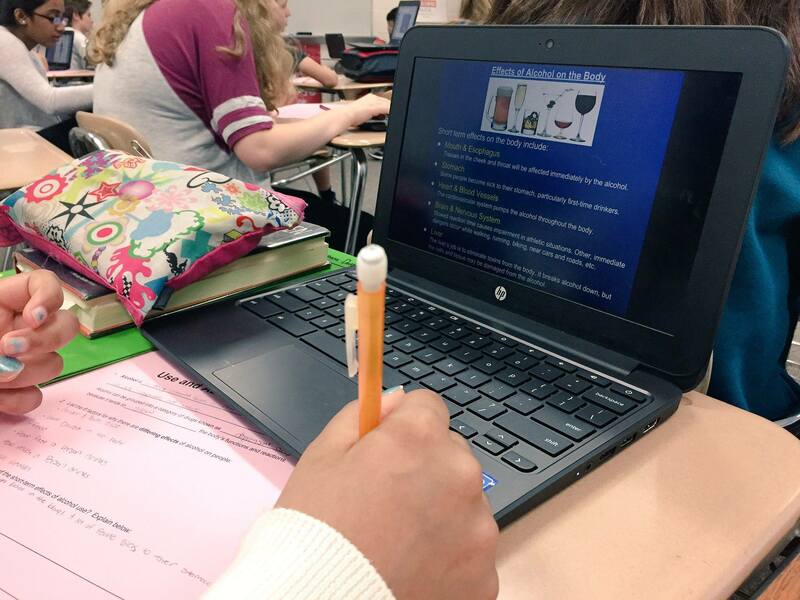 One final journal activity to consider is to use blank computer paper as handouts for students. (This is particularly useful in this day and age as we move towards paperless work and students show up empty-handed.) Provide a journal prompt, like usual, and then collect those who are willing to have it shared in a common binder. Typed or hand-written both work. With a 3-hole punch, put the accumulating pages into three ring binders that stay in the classroom. The binders offer up something for all students to read if and when they choose. For instance, before class, with downtime after other classwork, or at other times during the course as reference. Students can read reflections from their classmates and also from other class periods and/or school years. For added benefit, sort the journal entries, labeling the binders into at least three categories: mental health, social health, and physical health (or else Nutrition, ATOD, Disease Prevention, etc). Within these reflections will be an imperfect blend of thoughts and recommendations straight from the students themselves. Obviously, the teacher can monitor what goes in for content, accuracy, and potential usefulness. Remove and replace every quarter, semester, or year. Health skills can be embedded in such journal binders. For example, incorporate communication, influence analysis, decision making, and coping strategies to provide even more tabs within the running binders. Since these are “public,” students can either leave their work anonymous or have their name associated with their page(s). Analyze the influence that movies and TV stereotypes plays on teen development. What is important for a young person to keep in mind while viewing video clips? What can you explain about drug use and the human brain during adolescence? Feel free to write about brain development, tolerance, relationships, stress, and/or self-esteem in a way that may benefit future readers. What’s your best journal activity and/or journal prompt? Do you share reflections in any way? The class of students? Future classes? What questioning gets the best journal responses? Open-ended? Specific criteria? Other?